The Facts: Florida Personal Injury Laws for Slip and Falls - Law Offices of David M. Benenfeld P.A. Accidents happen more frequently than many of us realize. While we are all aware car accidents happen daily on the highways and streets of Florida, another common accident is a slip and fall. You might assume a slip and fall is a minor accident, and sometimes that is true. But other times, these accidents can lead to severe injuries and long-term complications for the victims. These injuries occur often enough for the state to enact laws to protect these victims as well. Therefore, if you are injured in a slip and fall, you should be aware of what Florida laws apply to your case and how they will affect your ability to receive compensation in the future. What is a Sunrise, FL Personal Injury Lawsuit? A personal injury lawsuit is a legal action victims use when someone’s negligence has seriously injured them. A slip and fall caused by someone’s inattention, negligence, or malicious acts qualify for a personal injury lawsuit under the state’s laws. While you have the right to file a personal injury lawsuit, the chances of your case making it to trial are low. This is because most injury claims settle outside of court through informal or formal lawsuit settlements. Informal and formal lawsuits apply to slip and fall cases, and only your attorney can decide which route will work best for your situation based on the evidence. While you wait for your consultation, you should familiarize yourself with these two methods for settling a slip and fall accident. Informal Lawsuit – An informal lawsuit is a legal shortcut, and the most common way settlements are reached in slip and fall cases. In this instance, both sides make an official agreement – which may be between the victim and insurance company or the at-fault party and victim. Extensive negotiations settle informal lawsuits, ending with a written finalized agreement. In this case, you sign a release that you will not seek further legal action against the insurance company or at-fault party by accepting the informal settlement. Formal Lawsuit – A formal lawsuit means that your attorney has filed an official complaint. The complaint is filed against the business, and other parties associated with the accident. Your claim will outline how you were injured, the role the defendant played, and the damages you seek. There are only a handful of statutes that govern personal injury, but those laws may also apply to slip and fall injuries. Most of Florida’s injury claims, however, are decided by precedent. That means past injury cases dictate how future cases will go. That is why you want an attorney who is well-versed in case law – to ensure you get a fair chance at a settlement. The defendant must have owed you a duty of care – which means they had an obligation to act with care to prevent you (or anyone) from being injured. The defendant violated that duty by failing to act or recognize threats to the safety of others. The violation of their duty is what caused your accident. You must show the link between your injury and the violation to qualify. You suffered damages because of the defendant’s violation of their duty of care. Personal injury cases, including slip and fall claims, are subject to a statute of limitations. A statute of limitations means that the state limits how long you have to file your complaint. Under Florida’s statute of limitations, you have up to four years to file an injury claim. If you fail to file a claim within the four-year mark, the court will not hear your case, and you will be barred from seeking compensation. Per the statute, you must discover the harm or have reasonable suspicion that someone’s negligence injured you and from that “point of discovery” the four-year clock starts. However, there are instances where the court will disagree with when a plaintiff should have discovered their injury. Therefore, do not assume you can wait four years before starting a case. Instead, speak with an attorney as soon as possible to get the process started and explore your options. Florida Damage Caps – is Your Settlement Affected? Florida does have damage caps, but these only apply to punitive damages. Therefore, your slip and fall case may experience a damage cap if gross negligence or malicious acts led to your slip and fall injury and you are awarded punitive damages. Currently, the state limits punitive damages to three times the compensatory damages or $500,000 – whichever amount is greatest. Realize that most injury cases, especially for slip and fall accidents, do not involve punitive damages. Slip and fall claims qualify for a variety of damages, but every case is unique. Therefore, the damages you receive might not be the same as someone else even if their accident seems similar to yours. Damages are based on the evidence, circumstances of the accident, and the insurance coverage of the at-fault party. Medical Costs – Medical expenses are the most common type of compensation in an injury case, and include all medical costs related to the injury – including future expenses. Lost Wages – If your slip and fall was serious, you most likely missed work hours. Whether it was a few days, weeks, or you are now permanently disabled and cannot work, you are entitled to compensation for those lost wages. 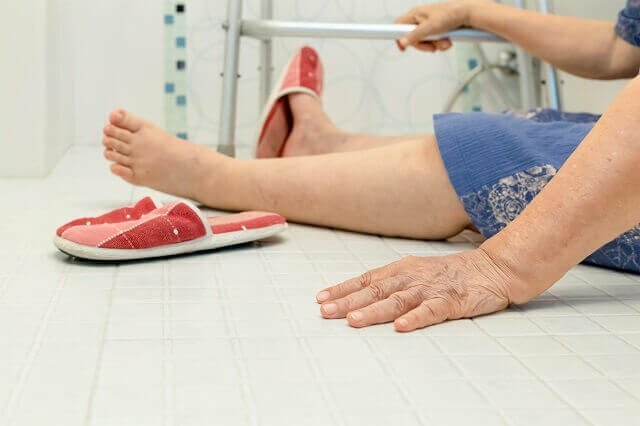 Permanent Disfigurement or Disability – When your slip and fall results in permanent injuries, you may receive compensation for that permanent disability. An example would be a slip and fall that leads to a traumatic brain injury and permanent brain damage. Another example would be permanent neck or back pain. Other Damages – These include emotional distress, mental anguish, physical pain, in-home nursing care, cost of hiring someone to help around the house, and any other costs directly associated to the injury and its impact on your quality of life. Different laws apply to personal injury cases, and the only way to know for sure which apply to your situation is to speak with an injury attorney and explore your options for compensation. Meet with an attorney from the Law Offices of David M. Benenfeld P.A P.A today for your slip and fall consultation. Schedule a free consultation and let our team discuss your legal options at 954-677-0155 or request more information online. How Can You Recover from a Defendant in a Car Accident Case? What Compensation Can You Receive for Nursing Home Abuse?